Exergy losses can by reduced by the use of an intermediate reboiler . However, this measure does not lower the total energy requirement of a column. But a certain part of the heat is supplied at a lower temperature in reboiler 2 as illustrated in Figure 7.11, Therefore, the energy cost might be reduced. An intermediate reboiler is advantageous only if several external heat sources, for example, steam pressure levels, are available for the individual reboiler. 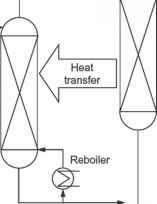 Analogously to an intermediate reboiler that provides heating energy at a lower temperature, an intermediate condenser can be applied to provide cooling energy at a higher temperature. This is an appropriate measure in cases where the condensation temperature at the top of the column requires a refrigerant. With an intermediate condenser a part of the required cooling energy can be provided by cooling water, which in general reduces the cooling costs. The combination of an intermediate reboiler and vapor recompression as illustrated in Figure 7.12 can also allow the use of a single stage compressor for mixtures with a high boiling point difference. 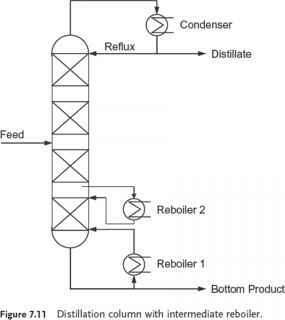 Figure 7.12 Distillation column with intermediate reboiler and vapor recompression. In a HIDiC system the stripping and rectifying section are divided into two different columns that are connected with each other by several internal heat exchangers as shown in Figure 7.13. The rectifying section is operated at a higher pressure and a higher temperature than the stripping section to achieve internal heat transfer from the rectifying section to the stripping section. A compressor and a throttle valve are installed between the two sections to adjust the pressures. 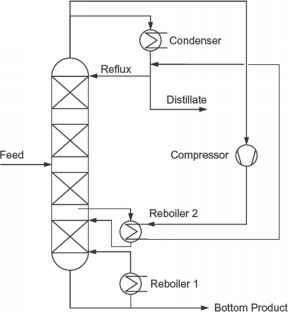 The reflux flows in the rectifying section and the vapor flows for the stripping section are generated by a certain amount of heat which is transferred from the rectifying section to the stripping section. Therefore, in principle the condenser and the reboiler are not needed and zero external reflux operation could be realized. Despite the fact that the HIDiC concept was introduced in 1970, it is still at the primary stage of research from a practical viewpoint and not commercialized so far for industrial application. Up till now the HIDiC technology has only been applied to a semi-industrial scale separation . 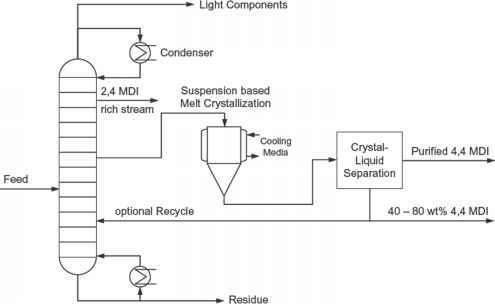 Figure 7.13 Heat-integrated distillation column (HIDiC). Is the condensor at a higher pressure than the reboiler?